This is pretty easy to do. 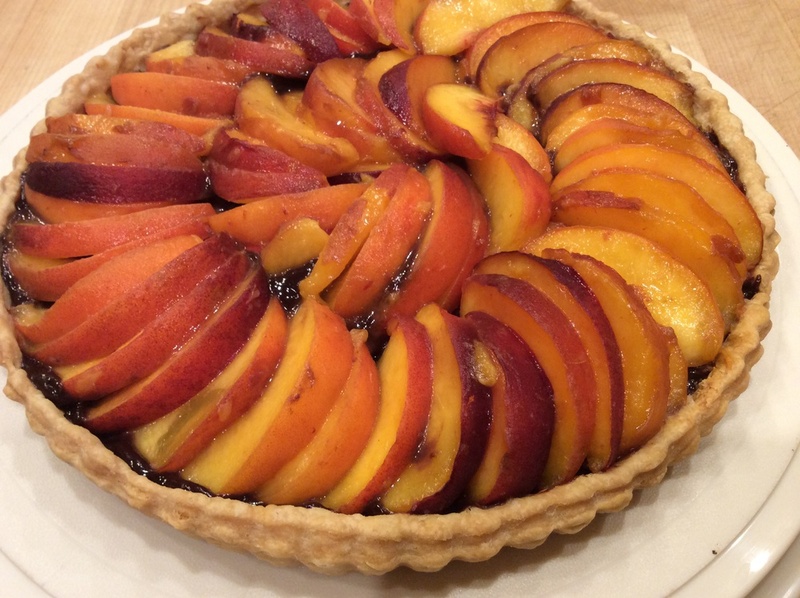 There are three components, the tart crust, the chocolate ganache and the peach filing. Let's start with the crust. By the way, if you have your own favorite pie crust, use it. Add the salt to the flour and stir. Then add the butter to the flour/salt mixture and use the snap method to integrate the butter into the flour (snap the butter between your thumb and 3rd finger). Keep at it until the butter is in little pieces. You can also use a fork if you prefer. Then add the vinegar to the water and add the liquid to the flour/butter mixture and stir lightly until the dough comes together. Don't overwork it. You still want pretty good size pieces of butter. Form into a disc and wrap in plastic wrap and refrigerate for at least an hour. Meanwhile . . . . .
Bring the cream to a low boil in a pot and remove from the heat. Put the chocolate in a mixing bowl and pour the hot cream in the bowl and add the butter and stir like crazy. After about five minutes of stirring, the mixture will be uniform. At this point, you can either set it aside or cover and put it in the refrigerator for later use. It keeps for several days without a problem. It will harden when it's cold, obviously. The butter gives it a really nice sheen. You can omit the butter if your're being healthy. This is pretty complicated. Take three ripe peaches and cut them in half along the pit. Then make about 1/4 inch slices and put them in a big bowl. Add a little bit of white sugar, maybe a few tablespoons, stir and let the peaches sit for 20 or 30 minutes. Technically, they are mascerating. Take the dough out of the refer and roll it out on a floured board until it's about 1/4 inch thick and about 12 inches in diameter. Then press it into a tart pan with a removable bottom. If you don't have one, then just use a pie pan. Press the dough into the tart or pie pan, including up the sides. Prick the dough on the bottom and then cover the bottom of the tart with a round piece of parchment paper or foil. Then put the pie weights (or dried beans if you don't have pie weights) on the crust. Now bake in a pre-heated 400 degree oven for ten minutes, then remove the weights and the parchment paper or foil and cook until the crust is lightly browned, another 20 or 30 minutes. When the crust is done, remove from the oven and let it cool. When cool, pour a layer of ganache about 1/8 inch thick. If the ganache is too solid to pour, warm it briefly in the microwave. Now arrange the sliced peaches on top of the ganache. If the peaches weren't super sweet, I'd sprinkle and bit of extra sugar over the peaches. I refrigerate the tart for a while so the ganache hardens. But take the tart out a while before you serve it. Enjoy!